For me, it’s all about the details. As a custom invitation and stationery designer at Chelle Paperie, often the first things I notice about a wedding are not the dress, or the flowers. What I pay attention to are the placecards, and the programs, and the tiny signs that label what dessert you’re picking up next. I’m in heaven when I get a bride who lets me do save the dates and invitations, as well as all the little paper goods you can go crazy on for your wedding day. Unfortunately, by the time most brides have finished wittling down their budget, reception paper goods are one of the first things to get cut. That just breaks my heart! So later this week, to make beautiful day-of stationery available on any budget, I’ll be offering printable table numbers, placecards, program covers, favor tags and all the other designer extras you didn’t even know you might need! A very heartfelt thank you to Maddy for including me this week as she’s busy getting ready for the launch of Nonpareil! Couldn’t agree more! I admittedly went over the top with all the hand made details but loved every second of it. Can’t wait to see what you’ve got up your sleeve and to check out your blog! 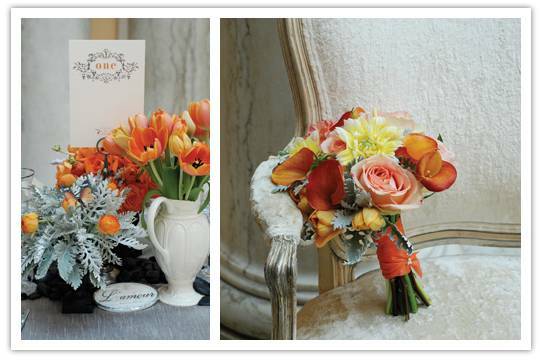 it’s so true about reception paper–love these pics–the flowers bring out the paper and viceversa–lovely!